10 August 2018 9 November 2018 | Marsha. Hi there! It’s August, it’s the 10th… And I have a new instalment of Inspired by for you! OK, so this summer thing is getting ridiculous. It was so sunny, hot and dry in the past month that all Dutch weather records have been broken. Yesterday was the first rainy day in a long, long time in the city where I live, and I was so relieved that I didn’t even mind having to bike through the rain while running an errand. The hot weather has had some effect on the amount of creative time I spent in the past month. My craft room is situated on the back of the house, and it catches the sun all afternoon and evening. It’s not a pleasant room to be in during a heat wave. We don’t have air conditioning, you see. Most Dutch houses don’t have air con, because it never gets this hot for long. Anyway. 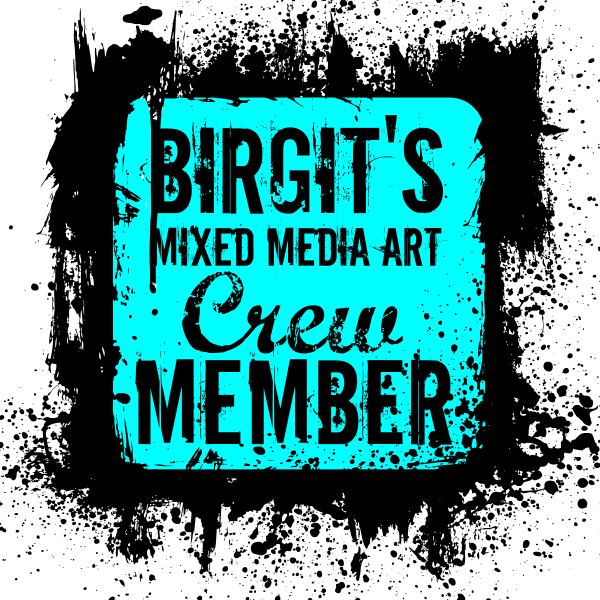 Here are a couple of things I can share! I’m currently one prompt behind, but The Stencilfied Journal is still going! From June through September fellow StencilGirl® Columnist Tina Walker is posting one prompt a week (16 in total), and we’re creating a ‘Wreck this Journal’-esque journal StencilGirl® style. I love it!!! If this sounds like something you’d like too, then check Tina’s Instagram or Facebook feed, grab a notebook, and follow along with the prompts! When Esther posted this photo on Facebook, I was reminded of my own stash of 1950s ladies magazines! I have been using a lot of magazine clippings in my art journals recently, and though I regularly do cut up vintage books for collage and transfer purposes, these vintage magazines had completely slipped my mind. The cutouts turned out to be just what the mini book I created for my latest Gelli Arts video tutorial needed! What I didn’t realise it at the time is that Esther actually sells these 1950s cutouts (among other vintage ephemera) in her Etsy shop. So check out BadAssPaperlover on Etsy if you fancy a stash of vintage cutouts too! Not only did I cut up books this month, but I also listened to (audiobooks) and read some. Because when the weather is too hot to do anything, I think reading is the very best way to spend your time. I’m also just inspired to read more. I keep wanting to buy books, but I can’t justify buying them if I keep adding to a bookshelf that is already full of books that I haven’t read. So if I want to buy more books, then I will need to read more books! When I didn’t read this past month, I tried to watch films. I’m deliberately choosing films over TV series because that can be such a black hole and I would rather spend that time reading one of those books from the shelf! I did go through the whole second Netflix series of Anne with an E though… But that only proves my point! OK, that’s it for this month’s heatwave edition of Inspired by! 10 July 2018 10 September 2018 | Marsha. Hi there! It’s July, it’s the 10th… And I have a new instalment of Inspired by for you! Pinning a theme to the past month is hard. Looking at my phone photos it was part clothing and style-type things, part creating, part enjoying beautiful sunny summer days and part filling the creative well. If you discount the endless full-length mirror selfie attempts, there is less photographic evidence than I would like there to be. In other words: this time I really did fall off The 100 Day Project wagon. So let’s start there. After last month’s Inspired by post, I was determined to finish my #100daysofusingacamera. So I made an effort. And then I let it peter out again. On my Marshas100DayProject Instagram feed it looks like I’m stuck at day 61, but in reality, I probably made it to day 65. I know I have at least one video and I certainly have a couple more photos that I could add. I think I know exactly what happened this time. When I look at my calendar, I can see that there were a couple of impromptu appointments and activities around the time that I stopped posting. Work-related stuff got postponed to the following week. So I had two weeks in which my schedule got mixed up, and I chose other things to come first. I didn’t quit photographing altogether, but I didn’t upload anything to my laptop, and I didn’t edit right away. I simply lost track. And from there it went all downhill. The 100 Day Project is wrapping up this week. I don’t know what I’m going to do about mine yet. I can continue (or rather: restart), I can leave it for now and maybe pick it up again in September, or I can just post the photos and videos I do have, draw my conclusions about the project and pull the plug. Now onto the things that did inspire me to create! I visited three museums in the last month: the National Military Museum, the Van Gogh Museum and CODA Museum. I think the visit to the Van Gogh Museum (to which my friend Birgit invited me) was the most successful one regarding inspiration, though the other ones definitely gave me food for thought about what I like and what I don’t like in a museum. The exhibition Birgit and I went to was ‘Van Gogh & Japan’, about Vincent’s fascination with Japan and his vast collection of Japanese woodcut prints. I have always loved Van Gogh’s studies of Japanese prints, but I had never really thought about what it was that I liked about them. This exhibition has helped me better understand what I love about (woodcut) prints and to pin down what it is that I personally see and love when I look at Van Gogh’s paintings. I didn’t consciously link what I did for my latest Gelli Arts® video tutorial with this recent visit to the Van Gogh Museum, but in hindsight, it may well have been of influence! Something that is still going strong and that is super fun to participate in is The Stencilfied Journal! If this sounds like something you’d like too, then check Tina’s Instagram or Facebook feed, grab a notebook, and follow along with the prompts! We’ve officially arrived at week 6 now, but I’ve yet to share my take on week 5. It still needs some finishing touches, and I will post it on Instagram later this week. Speaking of The Stencilfied Journal: working in the small journal reminded me of how much I loved working in my even slightly tinier Creative JumpStart 2018 (aff. link) journal. It made me decide to catch up on the Creative JumpStart videos I didn’t have time for in January, and I’ve created five more little journal spreads in my passport sized Traveler’s Notebook. In June I also started with a different kind of online course: Eerste Hulp Bij Styling (Dutch). This one is all about style and clothing, and I love it! I’m having one epiphany after another and I immensly enjoy doing the homework and exercises. The hot summer weather we’ve been experiencing here in the Netherlands has had an impact too. With summer on the brain, I thought about easy summer crafts, and I came up with this little video for Carabelle Studio. And in the last week of June, we tried to BBQ all of our dinners. Which was super fun because we discovered that BBQ-ing on weekdays is perfectly doable for us! Last month I mentioned that I ordered a couple of creative books to read over the summer. One of them is Crayon: An artist’s colorful guide to drawing on the go! from the Anywhere, Anytime Art series. Crayons… Oil pastels, wax crayons, water-soluble crayons… I have quite a selection of them, but I always feel that I’m not using them to their full potential. So when I was browsing for creative reading material, this book jumped out at me. What I didn’t realise at the time is that the crayons that are predominantly used in this book are Caran d’Ache Neocolor II’s. At first, that disappointed me a little because these are precisely the crayons that I do use quite often. But then I figured that there still must be something new I could learn about using them, and I started to do the exercises in the book. The exercises are simple and easy to follow. You can dive deep and spent hours or even weeks practising on just one of them (which is perfect for developing your own style). Or, you can do what I do: pick one thing from the exercise and do just one sketch/drawing to get a better feel for the material. This does mean that I’m staying reasonably close to what Monika Forsberg is showing in her examples. But that’s OK. It’s not my intention to share my results with the world. I’m just practising! The cool thing about Neocolor II’s is that they’re perfect for taking with you in an art-on-the-go kit and Forsberg has terrific tips in the book about how to decide what colours to bring. I keep my Neocolor II’s in jam jars, and when I want to create in the yard, I can just grab the jars, my sketchbook, a water brush, the Crayon book and I’m good to go! OK, that’s it for this month’s Inspired by! Riikka, unfortunately, has been coping with a painful hand injury. She’s only slowly trying to create again at the moment. She does have a post up for us today, and I’m curious to see what she has to share! Hop on over to Paperiliitin and please send her lots of love and well wishes!!! 10 June 2018 18 August 2018 | Marsha. Hi there! 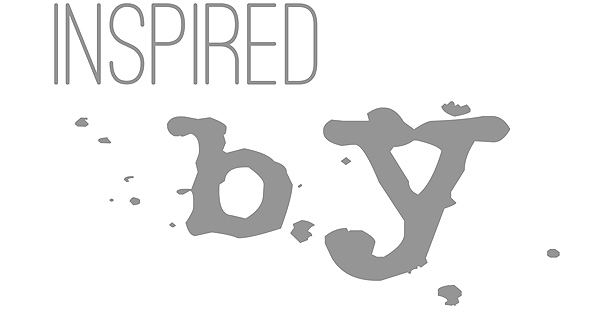 It’s the 10th… Here’s the June instalment of Inspired by! Let’s keep it short and sweet today! I don’t feel like I’ve been that creative… This month was more about digging deep, dusting off, blowing away cobwebs and letting go. There just wasn’t much room in my head for anything else! It also affected my #100DaysOfUsingACamera, so I’ll start there in a moment! I did spent time filling my inspiration well. I saw Wes Anderson’s new animation film ‘Ilse of Dogs‘, I went to the ceramic museum the Princessehof in Leeuwarden with my mom, and I visited Flehite, one of our local museums, on the last day before it closed for renovations. I also ordered a couple of creative books to read this summer, and watched ‘Krabbé zoekt Gauguin‘. In this television series the Dutch actor, film director and fine artist Krabbé tells the story of Paul Gauguin’s life, who he was, and what influenced him and his work. None of these things has inspired me to create. Yet. But you never know when it will come in handy! I made it to day 56 of the project. I missed nine more days since last month’s post, twelve in total. Which doesn’t have to be a huge deal, but I did skip five days in a row at one point. In my defence: I’m still in the middle of a major decluttering session, and there was scaffolding in our backyard. Everything was in a massive state during that week, and I just forgot about photographing altogether. I decided against quitting though. 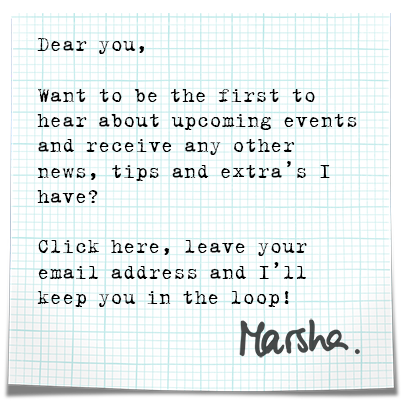 Because something is percolating on my Marshas100DayProject feed. It may not be apparent to anyone else, but I’m learning ‘things’. And I want to see if I can get clearer on what it is I’m precisely learning in the next 44 (or more) days. From June through September Tina will post one prompt a week (16 in total), and we’ll be creating a ‘Wreck this Journal’-esque journal StencilGirl® style. Tina already had me at ‘collab’, but the idea of ‘wrecking’ an art journal is just irresistible. The second prompt will go live tomorrow, and this one will reveal a bit more of what’s in store for the next prompts! If it sounds like something you’d like too, then check Tina’s Instagram or Facebook feed, grab a notebook, and follow along with the prompts. For the first prompt, I stencilled my pages using StencilGirl® stencils, a mini Gelli Arts® gel printing plate, and Dina Wakley Media acrylics. I drew the circles with Posca markers, and the übercute die-cuts are designed by Marlene Meijer-van Niekerk for StudioLight. I’m using a tiny 3.5″ x 5.5″ sketchbook, but any journal size will work. Just keep in mind that the journal *may* get wet, ripped up, stomped on, etc.! Here’s a perfect example of how filling your creative well can have results long after the fact. Back in March one of the prompts for Birgit’s ‘31 Days of Gel Printing Challenge‘ was to gel print on feathers. The feathers I had in my stash were too fluffy, and not suitable for printing on, so I decided to use them to print with instead. 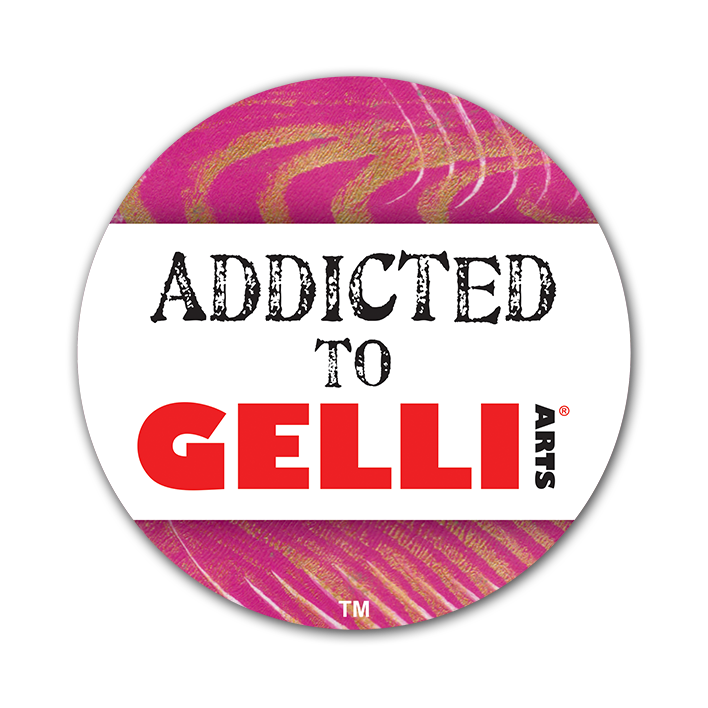 Fast forward to this month when Gelli Arts® sent new supplies for upcoming videos. The package contained these beautiful white feathers! They came in just in time for my next video tutorial, so I didn’t have to think twice about what I was going to demonstrate! The last thing I want to share is another visit to a local museum. You really do not have to go far to seek artful inspiration and to have a little fun. I only went to KAdE to escape the renovations at home for a bit, and I came home with fun video footage and lots of inspiration! That’s it for this month’s Inspired by! Don’t forget to stop by Riikka’s blog Paperiliitin to see what she was up to in the past month. 10 May 2018 10 July 2018 | Marsha. Hi there! It’s the 10th… And it’s time to share the May instalment of Inspired by with you! Unlike last month when I wrote that it felt like I had just shared my previous post, it now feels like I haven’t posted in ages. I don’t know whether that’s a good or a bad thing, but I do feel a bit like there’s finally light at the end of the tunnel. It also feels a lot like summer is here with super sunny days and high temperatures. So who am I to complain! I’ll start with an update on my #100DaysOfUsingACamera! I’m recording things that I haven’t recorded before or at least not in a while. I missed a couple of days, and apparently, Fridays are particularly bad days for picking up a camera. Most times I only seem to think of picking up my camera when I sit down. Which is often at the table in the living room. Or when I’m watering plants. This reminds me of how my husband always complains about the amount of food and drink related vacation photos. It’s just because when you sit down at a table you aren’t busy looking, following directions or doing anything else! I don’t feel like picking up the camera when I already spent a portion of the day on work-related photography. Which is OK. I’m rolling with it. The problem with work-related photography is that I can’t always publish a photo right away. But I still want all the entries to appear in the right order on my Marshas100DayProject feed, so I’m archiving these photos until the project I was working on goes online. In theory, this means it’s possible to catch a glimpse of something secret on my feed. But only if you watch it like a hawk. And don’t blink. I caved and ordered a small tripod. I didn’t think I would ever need one. But stacking books will only get you so far. And said books aren’t always around either. I promised myself beforehand that I wouldn’t have to take the look of my Instagram feed into account for this project. And I don’t. I just post what I have for that day. I do notice when/where the order of the feed could be better, BUT it surprisingly doesn’t look half as bad as I thought it would look! I even have an accidental colour scheme going on! I’m excited to find out what my conclusions at the end of the 100 days will be in this respect. On the note of just posting what I have: I’m still flying at the seat of my pants. I have collected a couple of photography challenge prompt lists, but I haven’t used any of them yet. All of my posts were spur of the moment ones or event or work-related. I do read Studio Polle‘s daily prompts for #100daysconceptualplayground every morning, and sometimes my photo is influenced by it. I never use the hashtag though because I don’t want to mess up the artful hashtag feed with my ‘real life’ photos. At the moment I feel neutral about the project. It’s not a huge deal. I’m not particularly enjoying it, but I don’t hate it either, and I’m determined to keep it going. I’m mainly curious about how I’ll feel and what I’ve learned once I’ve completed the 100 days. I think slow and steady wins the race in this case! 34 days down, 66 to go! Now let’s dive into my primary sources of inspiration this month! Knowing that I spend a lot of time at home, I anticipated going into the project that the subject of home decor and clutter would come up for me. So I made sure this was in a way part of Marshas100DayProject. Well over a month into it there are only minor changes visible. But there was a fair amount of decluttering going on in April, and I think both my husband and I are now much clearer on what we’re missing, what’s in need of change (or repairs) and what we would like to add (or get rid of). I’ve been studying interior design, home decor, styling etc. too. To be honest: it’s daunting. Especially if an interior designer sums up what makes a delightful home and your house doesn’t seem to tick any of the boxes. Is that going make all of my efforts pointless? Anyway: we’ve been gardening too. Sowing some climbers and sunflowers. Adding potted plants. Nothing too shocking because we have an idea about how we can change the yard to make it work better for us. We’re just not ready to tackle that project yet. Small steps! On the subject of flowers: I can’t remember if I wrote this already, but I enjoyed meeting Susan Tierney-Cockburn at the Elizabeth Craft Designs booth at Creative World in Frankfurt this year. And I’ve been dying to try my hand at making some flowers with her dies ever since. So in the build-up to Art Specially (which took place 14 & 15 April) Esther of Artchicks Studio lend me some of the dies to play with. Of course, I didn’t have enough time to complete any project with them yet, but at least I gave it a go. I have a list of project ideas though, and I will get to them eventually! I don’t know why and I don’t know how but accessories were a reoccurring theme this past month. It started with helping my aunt sort through some of her accessory drawers. Then I attended a fun and eye-opening workshop about accessories by style coach Chiara from Indiaan in je kast (which was organised by ‘my’ style coach Yolande Avé). Chiara gave a lot of useful information during the workshop, and there was a lot to think about afterwards. I organised my own jewellery and scarves the next day… And from then on I started to try on different earrings, rings and bracelets every day. Just for fun! I didn’t buy anything new until I visited the Jewellery – made by, worn by exhibition in Museum Volkenkunde. I could not resist some of the bangles that are sold in the museum shop. And I only went to see the exhibition because Chiara had mentioned it! I also found two new scarves, and I bought a couple of hair accessories to try out. But please don’t think that I’m now going to fill my closets with random new stuff! That’s not what I want, and I’m glad to report that I don’t have to. Because a huge point that Chiara makes is that the best accessories have stories. That’s why some of them are just ‘meh’ and others you will hang on to for the rest of your life. Chances are you will not find the latter on the highstreet anyway. You could. But probably not. There’s lots more to say about the workshop, the exhibition and the museum but because my inspiration didn’t end here, I’ll share more about it in my first column for StencilGirl® Talk. Which is coming up very soon, so the wait isn’t too long!!! The last thing I want to mention is printmaking. Layered printmaking. For my latest Gelli Arts® video, I was initially inspired by screenprints and those layered stamp sets that are all the rage right now. I went on a wild Google chase until I had an idea of how I could create something like it with the gel printing plate. And I found so many awesome things along the way that I wish could take a course in printmaking techniques!